Climb cart is basically a six-wheeled cart which can be folded and used to climb up the stairs easily. Using this cart, you can open the base section which is at the bottom and place anything which you want to move upstairs. Sounds exciting, doesn’t it? Such designs are best for reducing strains and helping you to transport things to the higher places. You can take things like the office supplies, garden supplies, or even furniture, laundry etc. shopping site. It is greatly loved by the customers who have used it. There are many interesting and unique features that are present in the Climb Cart that makes it a popular product in the market. Wouldn’t you want to know about that? Here we are about to tell you about the features that set this amazing product apart from many others on the list. The six wheels that are provided in the product help you in climbing the stairs very easily. This helps you in saving a lot of energy and no risk of any kind of strain. The design of the cart is so portable that you can literally take this cart anywhere you want to. You have the option to use it indoors and outdoors as well. For indoors, you can use this cart to bring the home decor or other things upstairs or downstairs. Though you might not use it daily this amazing product comes in handy during the holidays or when you are thinking to clean your closet. In addition to it, the product is very sturdy, lightweight and easily portable. So, it can be taken anywhere needed. Shopping becomes easier as all those heavy bags fit in the body perfectly and moves very easily. You can also use this product in your office to bring the transport files of the office up and down. Thought the body can hold a lot of stuff in it, doesn’t mean that it occupies a huge area in your house or office when it is not in use. The product can be folded very easily. The entire body of the product can be folded up flatly and can be stored in a compact place. Of course the wheel of the product can’t be folded; otherwise, the whole body is totally flat. You might be wondering that is this product strong enough to endure all the weight and the work that is known for? The truth is that the product has the strength to hold up to a hundred pounds. The strength endurance of this product is amazing as you can very easily move heavier things like the holiday decorations, furniture or file boxes of your office. Every product has good as well as bad sides. There is no surprise that even Climb Cart has got some on the list. It is important for the users to know what they are before they buy the product. So, here are some pros and cons of the climb cart which we can tell you. 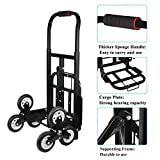 The wheels of the cart make the body to move very easily and thus helping you to take things up without applying much strength and no risk of getting a strain. That seems to be a perfect fit for those who consider carrying heavy equipment up or down the stairs. The product can be folded easily and doesn’t occupy much space of the surrounding. Easy to carry anywhere you want. You will be able to easily place the product in your car as well as it doesn’t take too much space. Well, the best thing about the Climb Cart is that it is safe for the elderly people as well. Carrying heavy items can be a bit unsafe for the elderly or for people with arthritis. This product proves to be a worthy addition to the safety measures that people can take. It is true that the company made any claims about the Climb Cart being an amazing product. However, this is also true that the cart doesn’t really have the ability to replace a durable and heavy-duty regular dolly completely. You might have to use a regular one for the heavy stuff. Sometimes the wheels are very tight and cannot be turned very easily. It is good in moving upstairs or going straight but doesn’t work well while taking a steep turn. This means that when you have to take turns, it can be a bit tough. Though the weight load of the product is more it collapses when taken a huge load. Moreover, the product doesn’t have much space. You cannot take all huge items at once. Knowing only the features of a product won’t help when you are out buying a climbing cart. You need to make sure that these features are made to use properly. Lucky for you, we have used the product ourselves and are ready to give you a detailed insight into the Climb Cart product. Well, one of the best things about the product would be the build quality. With parts and components that are extremely durable and long-lasting, this product becomes a great option for those who consider quality as their prime factor for selecting a climbing cart. There is no doubt that the parts are absolutely amazing and help a lot in the long run. Well, when it comes to the design, there is nothing that is wrong with the Climb Cart. The six-wheeled cart can be a great help to those who want to make sure that they are able to carry the shopping bags and laundry effortlessly. Also, the rubber coverage in the three wheels provides the much-needed grip when climbing the inclined areas. The amazing Climb Cart is really easy to use as all you have to do is unfold it and store your items and you are good to go. So much is the popularity of the product that most elderly people consider it for their daily needs as well. The Climb Cart can be used for taking mid-heavy stuff such as grocery bags, shopping bags, and laundry. However, it won’t be able to replace a regular dolly which has a much higher capacity for handling heavy items. Still, it might be a good option for people who need an extra hand in carrying their grocery items. This amazing hand truck is a great option for those who want to carry some heavy stuff up and down the stairs. With a 330-550 pound capacity, this is a heavy-duty product for sure. However, the Climb Cart can be a better product when the price and the features are considered. 【With Holes For Tension Rope Hooks】 With holes for tension rope hooks for improving the security of your transported goods. 【With Star-Shaped Wheels】Stair climbing trolley with star-shaped wheels to transport heavy loads up and down the stairs. 【Easy To Load】This hand truck has Solid Rubber Wheels, easy to load. 【Application】sturdy, durable tubular steel framed sack truck,Ideal for delivery drivers, farmers, builders and for use in warehouses. This is another product which comes in handy when it comes to lifting the heavy items like furniture and stuff. However, for the light-weight options such as grocery and laundry, the Climb Cart can be a more suitable and practical option. Our folding Stair Climber Bigger Trolley dolly cart perfectly balances lightweight capability with durability and features 6-wheel design that glides up and down stairs with ease. Take it to the supermarket, flea market or the beach. 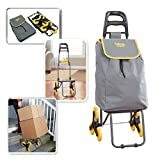 Collapsible and Portable; Easily folds down in half for compact storage when not in use; Store in the trunk of your car, under the bed, in the closet or garage. Multi-functional Uses; Use it as a shopping cart, grocery cart, utility cart, foldable cart, and overall exceptional cart on wheels with little to no assembly required; Remove the bag and it becomes a lightweight dolly capable of carrying up to 150 lbs. 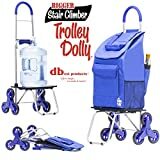 Live in a Apartment or Condo,no problem The Stair Climber Bigger Trolley Dolly climbs stairs more smoothly than any other stair climber cart or trolley on the market. Wheels are placed under the base to prevent the wheels of getting in the way of boxes. Contains 8 compartments for storage, which include a beverage holder, front flap pocket, inner pouch, rear pocket, umbrella holder and more; Your stuff goes where you go. This is another product that you might want to try if you want performance along with some great features. The fabric is weather-proof so that is a plus point. However, Climb Cart might be a better option when it comes to price along with the features. Flex tape can fix almost everything. Whether it’s a broken work or a hole in a wall, Let flex tape to do the job for you. Do you want to know more about flex tape? Then read here flex tape review. So, that is all you need to know in your Climb Cart Review. Hope this was as helpful as we want it to be. Climb Cart can totally be an efficient tool for the design and the features that it has. So, don’t wait and order one right now. Overall the product has got the positive rating. And also the product is really very useful, so don’t think too much you can go with it and take its advantages.